You know the scene… You're all tired and emotional from overindulging at Christmas lunch. It's still two hours til the Doctor Who Christmas special so you decide to play a game to while away the time. How would you like to ensure that you always beat your sister and annoying cousin Geoffrey? Dear readers, we present to you the Grime dice invented by our enigmatic friend James Grime. These dice are special because although the green die is likely to beat the red die, the red to beat the yellow, the yellow to beat the blue and the blue to beat the purple, the purple die has its chance to shine in the Sun and tends to beat the green! If this sounds confusing, it works in a similar way to the familiar game rock-paper-scissors, or the slightly less well-known rock-paper-scissors-lizard-spock.This is because both games are non-transitive. You can read all about them in James' lovely article or watch his explanation below. You can find out more about non-transitive games in the Plus articles Winning odds and Let 'em roll. Plus Advent Calendar Door #3: Where are you? These days that question is easy to answer. 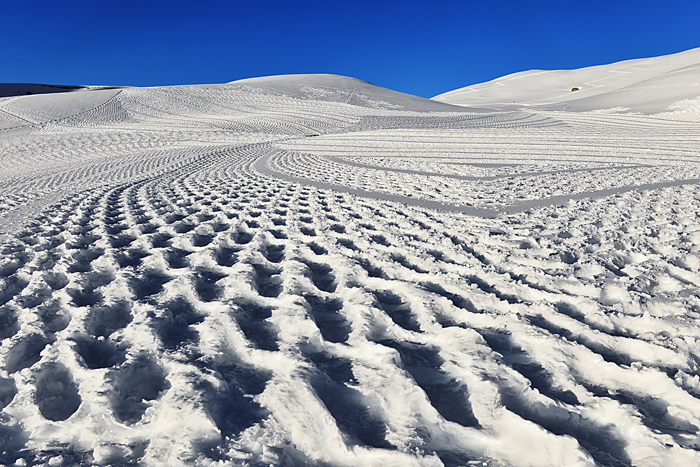 If in doubt, pull out your smart phone and check your coordinates. But it's not so long ago that people died for not knowing where they were. Many ships got lost at sea, crashed into rocks or ran aground because sailors couldn't figure out their longitude. The book Longitude by Dava Sobel tells the fascinating story of that tricky coordinate, why a prize was put on its head and how the puzzle was finally solved by means of a clock. This "true-life thriller" is one of our favourite popular science books ever! Time and motion tells you why getting from A to B is harder than you think. Conic section hide and seek explores how ancient maths can find people who are lost or hiding. Finding your way home without knowing where you are explains how insects navigate. On thin ice is a package we produced for use in the classroom, based on the maths of navigation. Have you recently taken up running in a bid to slow the inevitability of middle age? Or are you in the first glorious days of youth, feeling immortal and taking as many risks as you can? Or perhaps you've always taken the safe, and possibly unexciting, path? Whoever you are, you can find out just how dangerous a life you lead in The Norm Chronicles: Stories and numbers about danger by Michael Blastland and David Spiegelhalter. David, our favourite statistician, has guided us through many a sticky statistical situation and has met many of his own making, including an excellent round on Winter Wipeout. He wrote a column here at Plus and is responsible for the excellent website Understanding Uncertainty, as well as many other activities. Michael, journalist, author and radio producer, is the person who first introduced us to the world of radio and podcasting. He created the fabulous BBC Radio 4 show More or Less. You can find out more about how risky you are at the interactive website for Norm Chronicles and you can find out more about risk, statistics and probability here on Plus. There's not many things that have tempted us to leave our lovely job here at Plus and return to research, but reading Steven Strogatz's book Sync: the emerging science of spontaneous order was definitely one of them. It's a beautifully written book about the emergence of one of the most fascinating, and youngest, areas of maths: network science. Six degrees: The science of a connected age, by Duncan Watts, and Linked: How everything is connected to everything else and what it means for business, science and everyday life, by Albert-László Barabási, are equally brilliant accounts of the birth and early years of network science, all three written by researchers who played pivotal roles in founding this new area. You can read more about the maths of networks on Plus, including the networks behind our brains, rapping, crime fighting and the best parties. And to find out how this all started, why not watch our oscar-worthy movie below! You can read more about the bridges of Königsberg here. 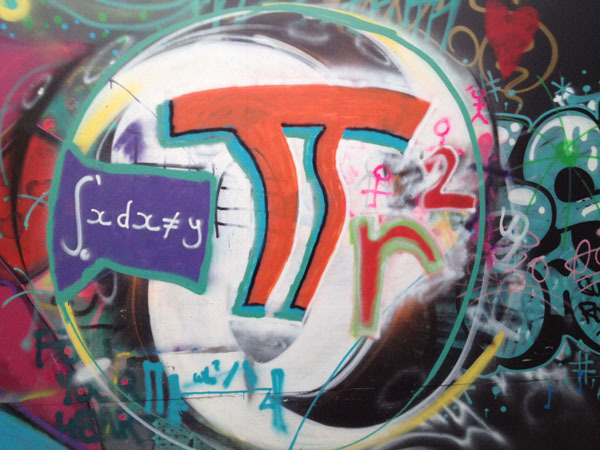 Our image of the week shows street art featuring the equation of the area of a circle. Image © Andrew Hale and Patrick Cully. The image was created by Andrew Hale and Patrick Cully, Research Engineers at Frazer-Nash Consultancy, studying for an EngD in the EPSRC Industrial Doctorate Centre in Systems, University of Bristol. See here if you'd like to find out more about the area of a circle. The picture is one of the images that appear in the book 50 visions of mathematics, which celebrates the 50th anniversary of the Institute of Mathematics and its Applications. You can see previous images of the week here. 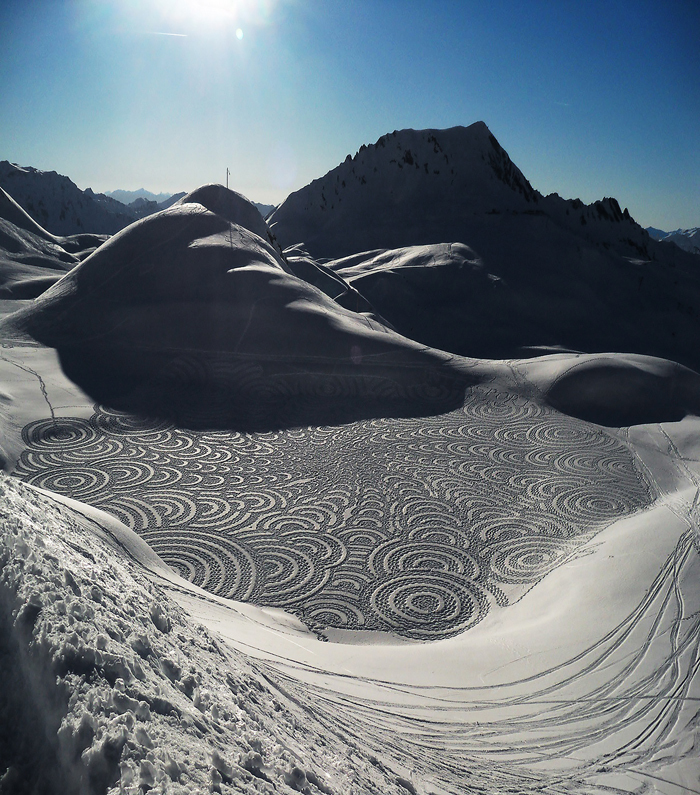 Our images of the week show the amazing snow art created by Simon Beck. 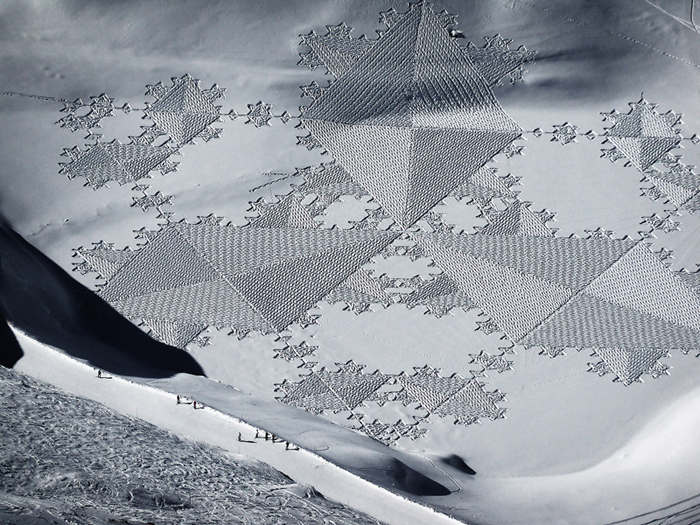 Snow art. Image © Simon Beck. 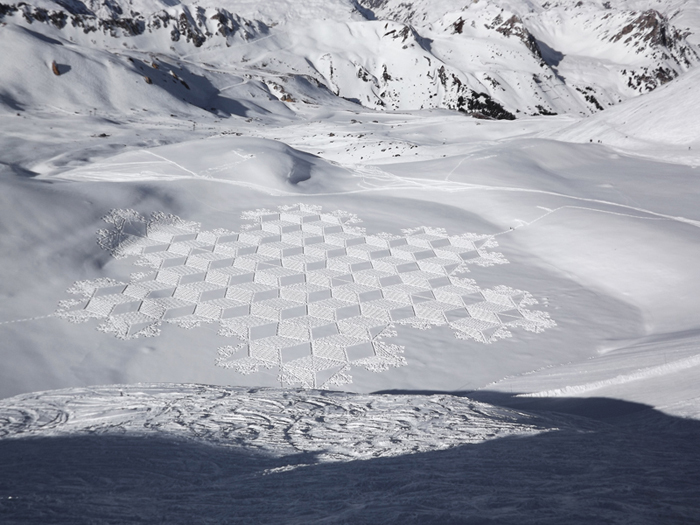 Simon Becks' book, Snow Art. 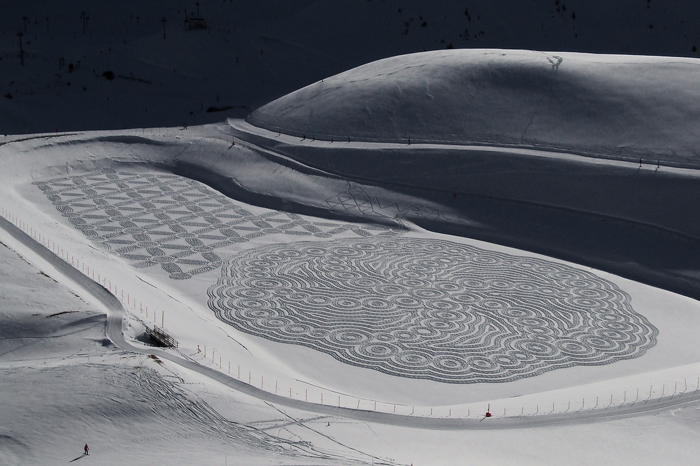 Beck creates those beautiful geometrical shapes by walking through the snow. The shape you see above is based on the Von Koch snowflake. To create the full shape, you start with an equilateral triangle and replace the middle third of each side by a "spike" consisting of two sides of a smaller equilateral triangle. Now do the same for each of the twelve straight-line segments of the resulting shape and repeat, ad infinitum. The Von Koch snowflake is an example of a fractal, a mathematical shape that is infinitely intricate and self-similar: it exhibits the same structures over and over again as you zoom in on smaller and smaller pieces. You can find out more about fractals here. Beck can't produce the Von Koch snowflake exactly, of course, because it involves an infinite process. But he has created an amazingly good approximation, which comes from using the first few iterations of the process. He gets the shape down in the snow by counting steps to measure distances and using a compass when changing direction to make sure he gets the correct angles between straight-line segments. "In the case of the Koch shape, I found I was soon able to judge the 60 degree angles and do it quicker to an acceptable level of accuracy without using the compass," he says.